Would you make up your mind already? Not only because of the fickleness of our wintry weather – I have witnessed it a few times in the past month, actually – no….but also because I decided to take some photos to record the strangeness of it. All within a matter of only minutes, the scenery would change….and then change again! In the late morning of Feb. 2nd, I went out to do some errands. Bright sunshine beating down. Blue sky. The sparkle of white snow in the fields and along the roadside. As I was driving back towards home, I noticed that the sky was turning back to grey with clouds blocking out the sun. ….no more sunshine and back to that blanket of grey clouds. And the wind joined in by blowing and swirling snow across the road…. ….as well as down our country road. 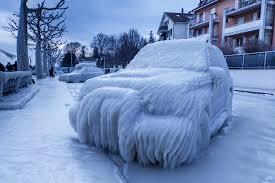 After I parked the car and got inside, I hunkered down all nice ‘n cozy and checked for messages. Now within a mere ten minutes – I kid you not! – I glanced outside. What ?!?! I went back out to take photos of these next three views! …..the only way one can make shadows is with the aid of the sunshine, yes? It truly felt as if that grey period hadn’t happened! So, feeling all gleeful again, I went back inside. Yep….a few more minutes later, and everything was grey everywhere again with lots of snow falling down. Lots of flakes. Big flakes. Except by that point, I stubbornly refused to go back outside and take photos. So, you’ll just have to imagine it, okay? Once nature finally decided to give us our share of snow and wintry temperatures, we have once again been able to enjoy the beauty of the white blanket everywhere on the ground, the white garlands and dresses of the trees, and the crisp or muffled sound that snow makes when we step on it. The always fresh and endlessly enticing magic of winter. One morning about two weeks ago I went outside, to take out the recycling at the front of our lane way, and noticed how the snow was smiling and twinkling at me……everywhere I looked it was glistening on the smooth snowy surface. Along with my favourite sound….the crisp and crunchiness of my steps on the hardened snow. I was itching to get all the recycling out – fast! You can imagine the fiddling I did with my camera settings so that I could capture those twinkles! So much fun! And it was worth it! This winter’s moon is shining so brightly tonight! And with that halo, it also adds a feeling of spookiness. I enjoy looking up at the sky during daylight hours for pretty clouds and sunrises and sunsets, as well as, on occasion late at night, looking at the moon and stars…..
Just now, a little after 3 a.m. I took out the garbage to the edge of the driveway (for pick-up later today), and as I was walking towards the far side of the house, I kept looking up to the sky, because tonight the moon is full and has this magnificent bright halo all around it with no clouds obscuring it from my sight. So, after putting the garbage in its spot, I ran back to the house and grabbed my camera and shot through the silhouetted black, spindly branches to capture that glowing moon orb. It was one of those beautiful, dreamy, mild winter days, where the outdoors simply calls to you. We heeded the call, but since there had been a good, deep snowfall for the past two days – and the snow was still light and fluffy – we felt that snowshoes were the way to go. My daughter had dropped in on her way through; she was headed back to her place. But first, as we couldn’t resist such an opportunity, my husband, daughter, and I strapped on our snowshoes and headed into our woods behind the house. I took a picture of my snowshoes – haha! And then the mini snowfalls that are created whenever someone pulls down on a branch. There was some “climbing” here and there……over tree stumps and up the hill back to the house. And here are the three of us (Sonja, our daughter, on the far right) – feeling great after some fresh air, some fun exercise, walking through the woods, looking for animal tracks and not finding any…..haha! And check out those rosy cheeks! And sticks to my fur. Hemingway was still a little kitten last winter so we kept her inside, although we could tell she was intrigued by the white blanket outside as she looked out the windows. So….this is her “first” actual outdoor winter experience. Once our area belatedly but finally got the usual amount of snowfalls for this time of year, we started letting her outside….including some fun “tosses” into the soft piles of snow. Well, it seemed to leave her undecided; didn’t take a shine to it right away. Yesterday, though, when we opened the front door, she scooted on outside and went right INTO the snow blanket! Then she discovered the shovelled path – in the above photo – and totally thought THAT was cool.. I think she just needed the snow stuff to grow on her, because today….every time we open the door, she’s right there and wants to jump into the fluffy fun stuff…..that licks and tastes a lot like water….and is just everywhere! Getting wet with water generally isn’t a big hit with her, but snow, on the other hand…..hmmm….. Her nice shaggy coat is keeping her warm as well. Yesterday I was looking through some older photos for my weekly photography assignment, and it was fun indulging in some memories that popped into mind from a trip in 2010 to New Zealand. Canada is my first love; my homeland. And New Zealand runs a really close second place! I still have some organizing to do with all the photos I took during that trip – moving things around on my computer – but I expect that I will share some more in the near future. 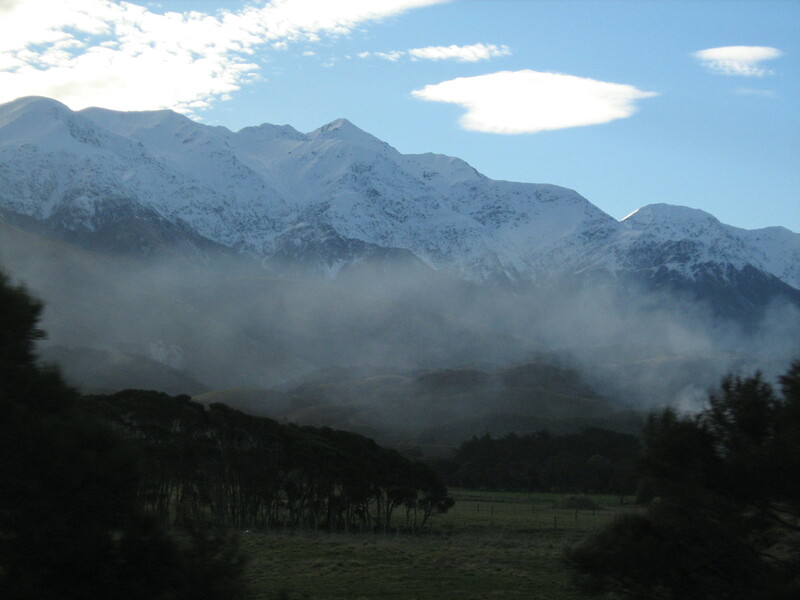 For today I picked these two photos, taken on a TranzContinental train trip that starts in Christchurch and goes through Arthur’s Pass to Greymouth and back….and it offers oodles of opportunities to take photos of the Southern Alps along the route. 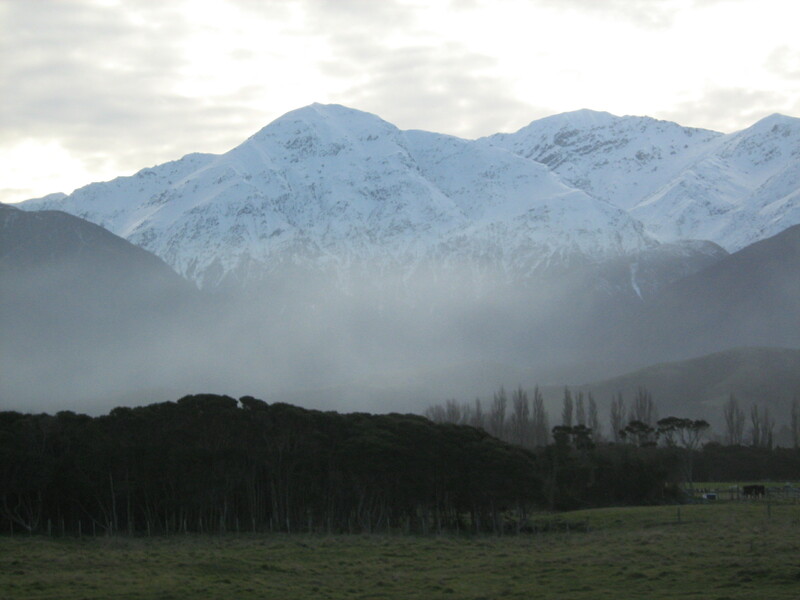 There were ample breath-taking and spectacular views of these Southern Alps. In these photos you can get a sense of perspective on the incredible height of these mountains, for example, in comparison to the trees in the foreground…..and those are NOT small trees! There are pretty clouds floating in the sky and some cheeky ones that floated down a bit lower in front of those picturesque mountains. It was a beautiful and cool, wintry day, when we rode on the train. There was an open-air car at one end of the train for people who wanted to have a freer look at the surrounding countryside – not through the usual glass windows – and, of course, the air smelled wonderfully fresh out there! I glance over to the right as some movement catches my eye. It is a city bus, making stops in the late afternoon. But the whole of its left side and back is one caked-on, plastered wall of dirty brown snow. I cannot look inside to see passengers. I don’t imagine they can look out those “walled” windows. As the bus comes to the next stop, I wonder…. Do the passengers notice a darkness to the bus interior? Once they have found their spot? Perhaps not even noticing the moving cave in which they temporarily seek refuge. I get inside and then drive.